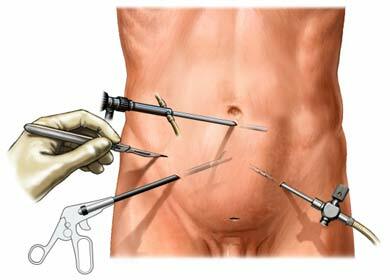 Laparoscopy is a type of surgery done through small cuts in the belly. Small tools and a scope with a tiny camera are placed through the cuts. This allows the doctor to see inside. Laparoscopy is popular because it usually shortens recovery time. It also leaves smaller scars in most cases. Depending on what’s worked on, you may need to clean out your bowels. Eat a light meal the night before. Don’t eat or drink after midnight. You may get other information from your healthcare staff. In most cases, you will have general anesthesia to keep you asleep. First, gas is placed into the belly to make it expand. This makes it easier to see the structures inside. The laparoscope is placed through small holes cut in the skin. Scopes can light, magnify, and project images onto a screen. Sometimes, other cuts are made in the belly. Tiny tools are used to take biopsies or fix problems. The cuts are closed with stitches or clips. The time depends on what is needed. Anesthesia will prevent pain during surgery. Medicines will help ease pain after it. Remove the dressing the next day if advised. Don’t drink carbonated beverages for a brief period of time. You may return to normal activity in about a week. Your doctor will talk to you about a care plan if a diagnosis is made. Biopsy results may take up to a week to come back. Diagnostic laparoscopy patient information from SAGES. Society of American Gastrointestinal Endoscopic Surgeons website. Available at: https://www.sages.org/publications/patient-information/patient-information-for-diagnostic-laparoscopy-from-sages. March 1, 2015. Accessed July 2, 2018. Laparoscopy. The American College of Obstetricians and Gynecologists website. Available at: https://www.acog.org/~/media/For%20Patients/faq061.pdf?dmc=1&ts=20130723T1313462445. Updated July 2015. Accessed July 2, 2018.